VISION CL series of VRLA batteries are recognized as the most reliable and high quality battery system in the industry. VISION CL series batteries designed with advanced AGM(Absorbent Glass Mat) technology, Long service life designed with 20 years, the batteries comply to the most popular international standards, such as IEC896-2, BS6290-4, Eurobat Guide. You can expect our batteries meet with the standards DIN, IEC & BS6290-4. We have obtained ISO9001 & ISO14001 certification. We have obtained UL approval (MH25860) for all types of batteries. We have obtained CE approval for all types of batteries. All these render our batteries to be compatible with requirements of world-level equipments. Communication equipment, Telecommunication control equipment,Emergency lighting systems, Electric power systems,Power station, Nuclear power station, Solar powered and wind powered systems, Load leveling and storage equipment, Marine equipment, Power generation plants, Alarm systems, Uninterruptible power supplies and stand-by power for computers, Medical equipment, Fire and security systems, Control equipment, Stand-by electric power. Positive plates are made from a Lead-Calcium system. Negative plates are made from a Lead-Calcium system. The glass fiber separators in VISION VRLA batteries have high absorbability to acid. 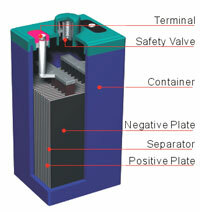 The high porosity of the separators retains adequate electrolyte for the reaction of active materials in the plates. The venting system, which operates at 1 psi to 6 psi (0.07-0.43kg/cm2)is designed to release excess gas and keep the internal pressure within the optimum range of safety. At the same time, it protects the negative plates from contamination from oxygen in the air. Vents are 100% visually inspected during battery production. Depending on the battery model, the terminals may be F10......Excellent terminal sealing construction has been achieved by using long mechanical sealing paths and A selection of small shrinkage ratios for the sealing materials. Standard case and cover are manufactured from ABS resin.